WordPress was recently upgraded to version 5.0.3 on blog.ryerson.ca. With this upgrade came a new editor for posts and pages, known as ‘Gutenberg’. Since August, blog administrators have been able to activate a Gutenberg plugin for their blog, to give them a preview of what was coming. In this post, we will cover some of the Gutenberg basics, and let you know how this change may impact your blog. On Friday, February 15 from 6 a.m. to 8 a.m., we will be upgrading blog.ryerson.ca to version 5.0, “Bebo”. During this time, the system will not be available. Last year, we announced that a new way of editing posts – a block editor called ‘Gutenberg’ – would be coming soon. 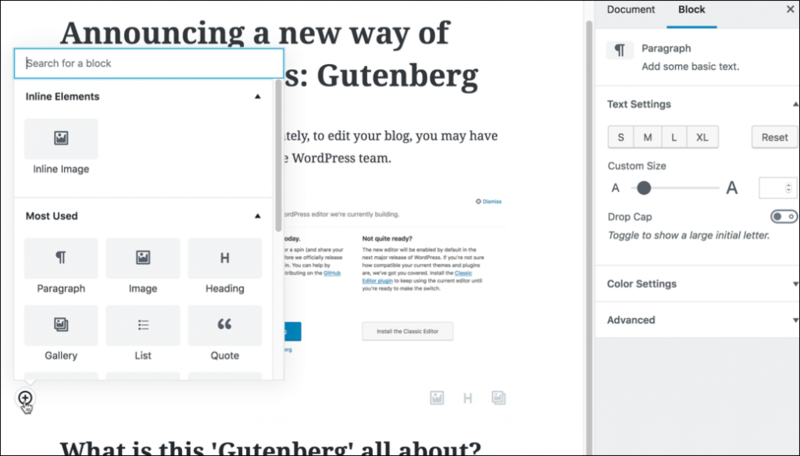 WordPress 5.0 includes Gutenberg as the default content editor. This may present a bit of a learning curve for some. It would be ideal if everyone could take some time to become familiar with this new editor, but we understand that not everyone has extra time. As such, there will be a new plugin called “Classic Editor” that each blog administrator can choose to enable if they would prefer to stick with the “old” post editor for the remainder of the term. For details on the coming upgrade, please see the WordPress release notes: WordPress 5.0 “Bebo”. How will my blog be impacted? As always, we are conducting a broad range of tests to ensure the upgrade doesn’t negatively impact our network of sites. Unfortunately, we cannot test all combinations of plugins, themes and content types. If we find any issues related to the upgrade, I will update this post (see the list below). After the upgrade is complete, please contact us if you have any issues with areas of your site that worked prior to the update. Categories – when assigned in Post Editor screen. Some users receive an error message when attempting to save/publish a post with certain categories selected. In the list of posts, use the ‘Quick Edit’ feature to assign categories after the post has been completed and published. Audio/video playlists – no block There is no audio/video playlist block at this time. Use the “Shortcode” Gutenberg block, with the playlist shortcode. Details can be found on the WordPress codex. Button block doesn’t respect colour selections when using Twenty fourteen theme. Despite selecting foreground and backgroundcolours, the button background appears bright green (from the Twenty Fourteen theme) Workaround: Instead of selecting one of the colour options you see, click the multicoloured wheel and select a ‘custom’ colour. These seem to work as expected. Add block option (“+”) does not always display between blocks. When you hover on the borders in between, above and below blocks, the + icon should appear to add a block in that space. Sometimes the one above the currently selected block does not appear. Workaround: Try selecting another block, to shift the focus OR save your post as a draft and reload the post editor. Wordpress outage Friday, April 12, 6 a.m. to 8 a.m. The blog.ryerson.ca network will be undergoing maintenance at this time, requiring an outage of at least 1 hour. Find out more at WordPress outage April 12, 2019. Every Friday from 6 a.m to 8 a.m, blog.ryerson.ca may be unavailable due to regular site maintenance. We apologize for any inconvenience. Opinions expressed in this weblog system do not necessarily represent those of Ryerson University. It is the responsibility of each blogger and participant on blog.ryerson.ca to ensure that their conduct is ethical, in which it does not violate the terms of FIPPA. By using this system, you have agreed with the terms of the Computing Guidelines regarding use of a Ryerson University resource.